L.A.'s Homicide Rate Lowest In Four Decades The decrease is part of a nationwide trend of decade-long declines in homicides. Among the theories about Los Angeles' success: Police have new crime-predicting tools and better community relations; sentences are stricter; and the crack cocaine wars aren't as lethal as they were in the 1990s. 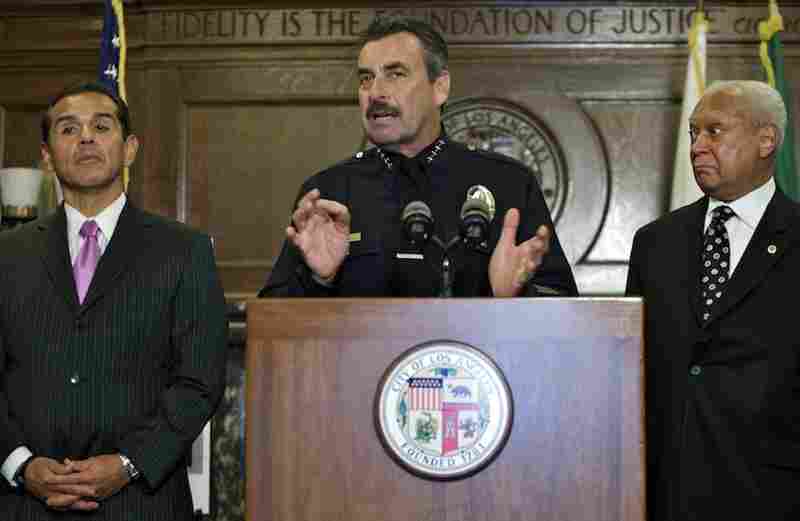 Los Angeles Police Chief Charlie Beck (middle), Mayor Antonio Villaraigosa (left) and Police Commission President John Mack detail the city's crime figures, the lowest in four decades. Christmas morning was bloody in Los Angeles' Echo Park neighborhood, when one man was shot dead and three pedestrians were wounded by a group of men riding in a car. It used to be this way often when Echo Park was a violent gangland, but not so much anymore: L.A.'s homicide rate is the lowest it's been since 1967. "Years ago, it used to be wild, people getting crazy," says Jose Larumbe, a cook who lives in Echo Park. "Now it's relaxed," adds his son, Jesus, 12. They both credit the police. Larumbe's 15-year-old daughter, Griselda, says they don't hear as much gunfire or see as much gang graffiti as they used to. "Before, there used to be lots more gangsters," she says. "They're not doing much damage anymore." Jesus notes that the gang members don't even look the same as before. "You don't see those people with their pants down to there," he says, pointing to his knees. "They now wear skinny jeans." But the crime decline is not just a new fashion trend. 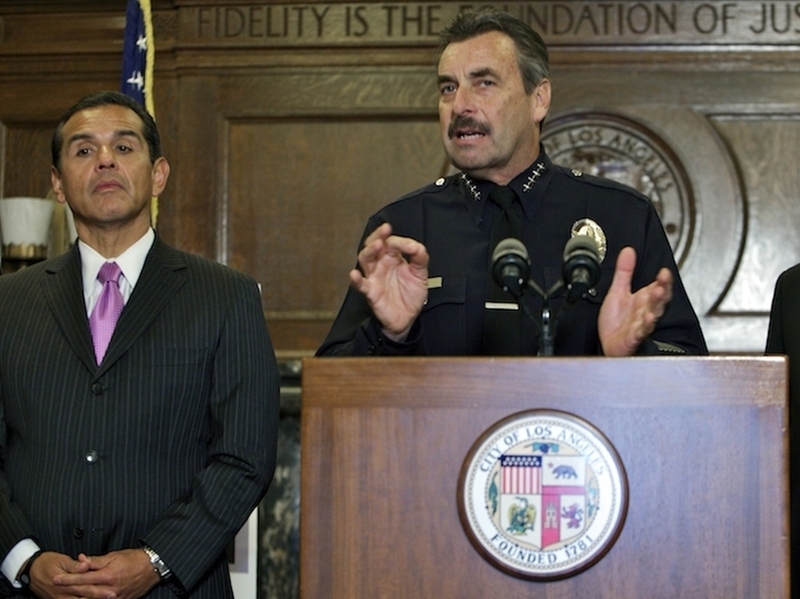 Mayor Antonio Villaraigosa announced there were 297 homicides in Los Angeles last year, a huge drop from the more than 1,000 slayings in 1992, the height of a massive drug epidemic. "This achievement is particularly noteworthy given the state of the economy," he said at a news conference. "You walk down downtown, you go to Hollywood, we all know -- this isn't hyperbole. Everybody, we all know it's a changed place." Police say more than half of the city's homicides are still gang-related. But Villaraigosa says things have improved because of former gang members- turned-interventionists "who immediately after a shooting make sure they are calming the waters in communities where otherwise there may have been a retaliation." Police Chief Charlie Beck told reporters another reason was that he finally was able to hire enough officers to patrol the city and work with the community to prevent crime. "For the past nine years, and no other city's done this, crime has dropped every year in Los Angeles," Beck said. "Every year." Last year, New York, San Francisco and Milwaukee, to name a few cities, saw a slight increase in killings. But even there, and across much of the country, homicides have been on a decade-long decline. "Crime generally has been going down since 1994; it's now half what it was in 1994," says UCLA public policy professor Mark Kleiman. "It's a spectacularly dramatic social change." Kleiman says police departments have new crime-predicting tools and sometimes better community relations. Sentences are stricter, and there are more prisons. There's another big difference between now and the early 1990s, when the crack wars were at their peak: "Crack dealers have learned how to do business without killing each other," Kleiman says. "In the early days, it was like a gold rush, and people were literally shooting each other on the street corners. "They were also heavily armed and shooting each other over petty interpersonal disputes." Kleiman says that has calmed down because "a lot of the people who would be committing murder in L.A. are dead, and the rest are doing life in prison." Criminologists have various theories about what has caused the decrease in homicides, from changes in demographics to economic factors. But experts can only speculate, and they can't predict whether the downward trend will continue.